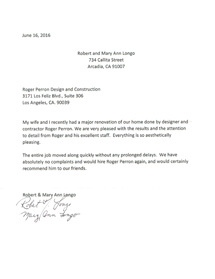 Longo » Roger Perron Inc.
My wife and I recently had a major renovation of our home done by designer and contractor Roger Perron. We are very pleased with the results and the attention to detail from Roger and his excellent staff. Everything is so aesthetically pleasing. The entire job moved along quickly without any prolonged delays. We have absolutely no complaints and would hire Roger Perron again, and would certainly recommend him to our friends.